Okay so everyone knows about how two months ago U2 dumped their album onto everyone’s phone, in an apparent violation of privacy, and on came the enormous amount of hate. Well I’m here to try and let you know they are cooler than you think. Reason #1 – Influenced many bands you love today – You like Coldplay, The Killers, Oasis, Snow Patrol, Radiohead, Arcade Fire, Foo Fighters, Kings of Leon or 30 Seconds To Mars.? Well they have all been influenced by U2 in one way or another. Coldplay frontman Chris Martin is a massive fan, claiming U2 is the only band whose entire back catalog he knows by heart, and telling Rolling Stone that “A Sort Of Homecoming” from The Unforgettable Fire is the first song he played to his unborn baby. Reason #2 – Product RED – Ever seen a red iPod and found it strange since Apple usually use really bright colours, when this would of been a deep red. That would of been due to it being made in partnership with Product Red. Wikipedia explains Product Red as a licensed brand that seeks to engage the private sector in raising awareness and funds to eliminate HIV/AIDS in Africa. Co-founded by U2 frontman Bono, they have partnered with Nike, Apple Inc. Starbucks, and Penguin Classics to raise funds. Earlier this year U2 released a new song during the Superbowl that could be downloaded for free over a twenty four hour period (they didn’t “force” it onto your phone, so nobody was having a major whinge). This was done in partnership with Banks of America who would donate $1 for every download to (RED). In the end $3,138,470 was donated. I always find it hard to discuss what music I like because it can be quite varied. Now I’m not saying my music tastes are that disperse, or that I’m “sa indie” for having a mix of Kanye, John Mayer, The Beatles, and Taylor Swift in my most played, but at they end of the day it is quite a mix of artists. 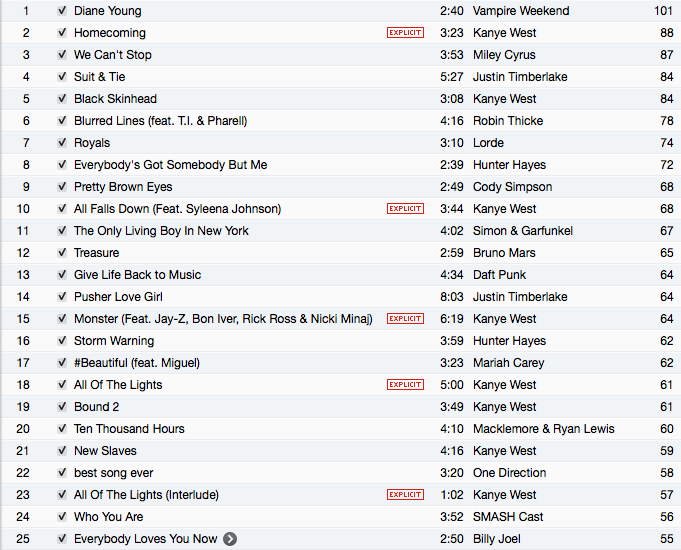 So I thought I share my top one-hundred most played on iTunes, as it is a peek into what I listen to most, and also as these songs kind of form a collection of the sounds coming out of bedroom over the last two years.